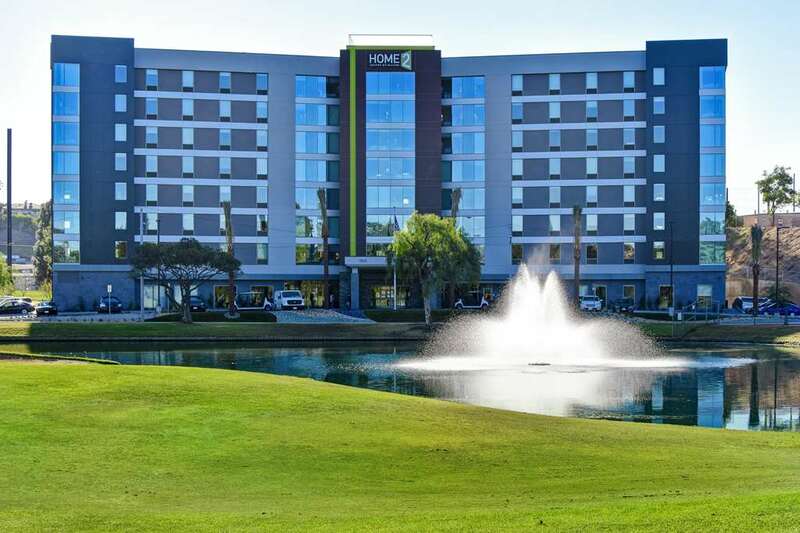 Our Los Angeles Montebello hotel is located in the serene suburban area only eight miles outside downtown LA with easy access to businesses and attractions. Catch a game at Dodger Stadium or enjoy a show at Staples Center both about 15 minutes away from the hotel. Spend a fun day out at the Universal Studios Hollywood 20 minutes away or take the kids to the Disneyland Resort only 30 minutes* drive away. Relax in a comfortable suite at our extended-stay hotel in Montebello Los Angeles. Feel at home with amenities including an innovative Working Wall free WiFi and a sitting area with sofa bed. Prepare a meal in your full kitchen equipped with a dishwasher microwave and refrigerator. Select a one-bedroom suite for extra space and privacy plus oversized windows with beautiful lake views. Don*t forget to pack the leash as Home2 is your pet*s home too. Start the day with free breakfast daily at our Inspired Table and buy snacks and sundries at 24/7 Home2 MKT. Enjoy access to the 18-hole championship golf course and in the evening have a BBQ dinner in the outdoor patio with grills and fire pit. Our Los Angeles Montebello hotel features an indoor/outdoor pool maintained with natural minerals and a Spin2Cycle facility where you can run a load of washing while exercising. We offer a business center a boardroom for 20 and a meeting space for up to 60 guests ideal for small business or social events. Mr M*s Hot Wings and Things: Vibrant tavern known for its hot wings serving comfort eats Italian dinners and bar bites. Lucille*s Smokehouse BBQ: Regional chain serving slow-cooked meats - other southern style eats plus cocktails. Olive Garden: Lively family-friendly chain featuring Italian standards such as pasta 7 salads with a full bar. Chinese Garden Restaurant: comfort food small plates quick bite.